Leaving Buenos Aires behind us we catch a flight to the modern city of San Juan, our base for the next couple of days. Despite being somewhat overshadowed by the fame of Mendoza, San Juan is the second largest wine-producing region in the country, and this afternoon we have the opportunity to visit one of the many vineyards on the 'Ruta del Vino' to try some of the first-class local specialties. Alternatively there is an open, free, wine museum in the city centre which gives an interesting look at the region's wine producing history. Another other-worldly landscape awaits us today as we drive to the magnificent Talampaya National Park. Once the kingdom of dinosaurs, this park, along with its neighbour, Ischigualasto, contains an important number of fossils, providing a sequential record of life through the Triassic period. The scrub desert boasts fossilised remains of a wide range of indigenous animals and plants from roughly 250 to 200 million years ago. Even for those amongst us who are not scientifically-minded, the park is an impressive show of geological wonders.The main attraction is the canyon, an imposing red rock trench carving through the desert floor. From here we can observe the oddly shaped rock towers with evocative names such as the Chimney, the Monk, the Elevator and the Cathedral - more akin to a Martian journey than our expectations of Andean scenery. This afternoon we continue to the town of Catamarca and check into our hotel. This morning we have some free time in Belen, a small town with a strong Andean heritage, very different from the cosmopolitan cities of Buenos Aires and San Juan. We may have time to spend admiring the hats, sweaters and ponchos woven from llama and vicuna wool by the local traders, many of whom are maintaining pre-Hispanic methods of weaving. Leaving the town this afternoon, we head towards the winelands of Cafayate, stopping at the ancient ruins of the pre-hispanic Quilmes civilisation en route. The Quilmes people, dating back to around AD1000, resisted the Incan invasion and lived through over a century of Spanish colonisation before succumbing to disease and war. The large site is made up of the remains of terraces rising up the cacti-covered hillside - we can walk to the top for excellent views of the valley and the site. Although not as impressive as other archaeological sites in the Andes, it helps us to understand the indigenous heritage in this part of Argentina. This morning we head out for a round of wine-tasting in one of the area's rustic wineries, their rows of vines backed by the stunning mountains beyond. Torrontes is the wine of choice here - a white wine that is well-known for being produced in this region. 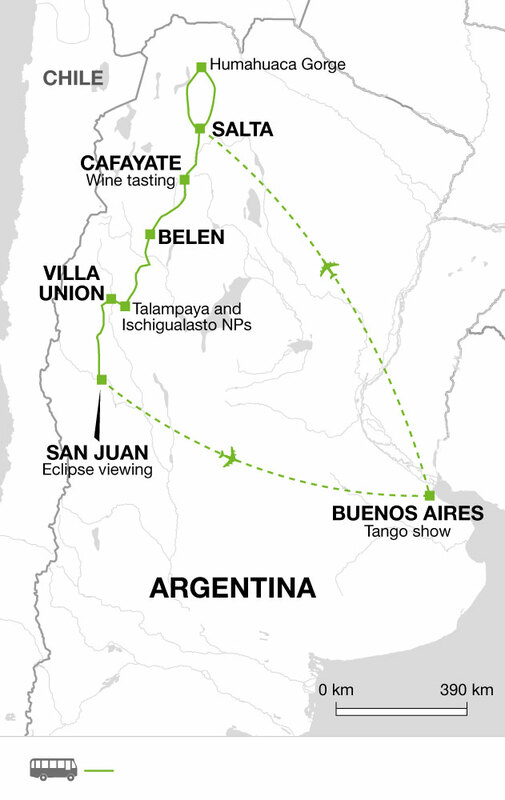 Later in the morning we take route 68, which connects Cafayate and its surrounding winelands to the city of Salta. The views down this road are spectacular, particularly in the Quebrada de las Conchas, or 'Shell Gorge', with its bright orange jagged rock formations standing out against the greens of the sparse trees and bushes that line its walls. There are some impressive geological formations on show here, all shaped by the winds that have blown through the gorge. After making several stops on our way, we arrive into Salta in the afternoon, and discover the city on foot. Salta's grand neo-Classical buildings and bustling town squares are perfect for exploring on foot. In the heart of the city we discover the extraordinary pink cathedral and the San Francisco Church. We get a great view of the city and surrounding valleys from San Bernardo Hill, a slog of more than 1000 steps, with the 14 stations of the cross built into the side of the hill. Fear not, as we plan to take the cable car up to the top, where we will find an amphitheatre and coffee shop, and we may see some of the locals looking for a shady spot to prepare mate - a bitter green tea drink that takes centre stage in most Argentinian social gatherings. We have free time this morning to wander around the peaceful squares and streets of the city before taking a flight later this afternoon back to the hustle and bustle of Buenos Aires, which will be a huge contrast from the quiet and open landscapes of the Andean region. This evening is free to enjoy something of Buenos Aires' dazzling nightlife.